Question: Help, I added Dawn dish soap in the dishwasher by mistake. The kitchen flooded and there is a huge mess. How do I remove the dish soap from the dishwasher so it won’t keep bubbling up and flooding my kitchen with water? 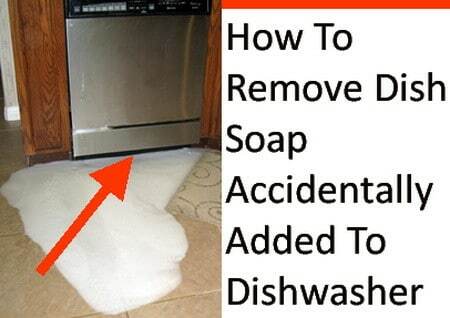 Simply grab a sponge or rag and remove as much of the dish soap and suds from the inside of the dishwasher. Once you have removed as much of the liquid soap as possible from the bottom and walls of the inside of the dishwasher, pour in 1/2 of a cup of distilled white vinegar and sprinkle some table salt over top of the vinegar. Shut the dishwasher door and run the machine on normal setting for a few minutes. After a few minutes, open the dishwasher and check to be sure that the excessive bubbles and suds have reduced and will not overflow. Once you know that the vinegar and salt have done there job as an anti-foaming agent, close the washer door and let it run a full wash cycle. You can open the door and check periodically to be sure the suds are not forming. If suds and bubbles are still present, repeat the complete process until the bubbles have subsided. Letting the dishwasher run a full wash cycle (after adding vinegar and salt) will remove all of the Dawn or Joy dish soap and the excess soap bubbles will not occur again. NOTE: If you do not have vinegar to fix your bubbling dishwasher, use the instructions above and substitute with olive oil instead.